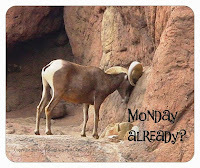 Tucson Daily Photo ~: Another "Monday Already?" club member! I am delighted that our latest "Where is This?" 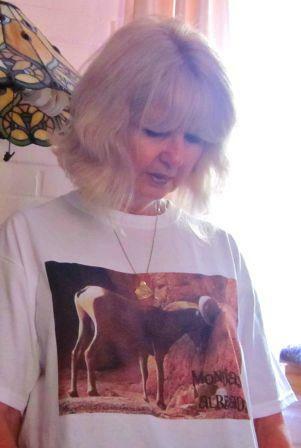 contest winner has sent me a photo of herself wearing her prize - the unique "Monday Already?" t-shirt! Thanks, Nancy, for identifying the Manning House and for being such a good sport to send us your portrait! And if any of you are hankering to have one of these 100% cotton shirts of your very own, I'll remind you again that they are for sale and that part of the proceeds go to the AZ-Sonora Desert Museum (home of the downcast ram). Nancy, you ROCK! !